Ingredients for cooking Greek-style Chicken Skewers With Tracey working very hard at the moment, I have frequently been doing my "Stavros the Greek Cook" impersonation. She's wanted something quick and tasty, often before going back to work in the evening. These chicken kebabs are a particular favourite. Cut a couple of skinless and boneless chicken breasts into lumps about 2cm (or three-quarters of an inch) on a side. 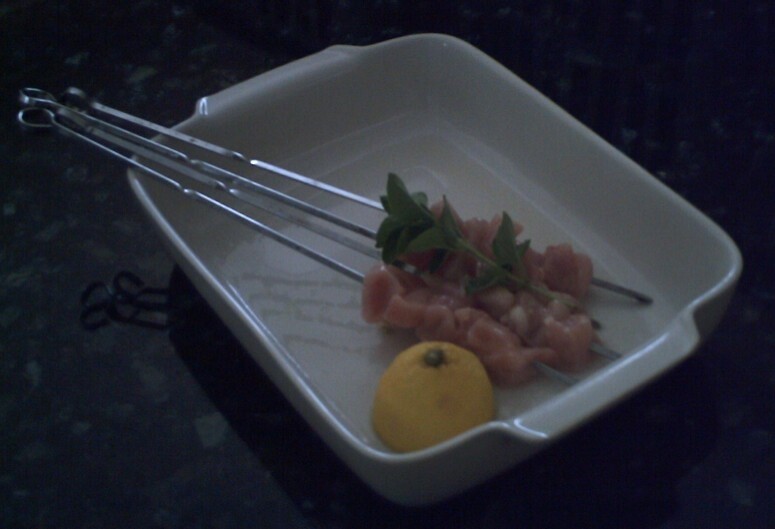 Thread five or six pieces onto long metal skewers - you should have enough chicken for four kebabs. Stick the dish in the fridge for half an hour - I can then present the uncooked, marinated skewers to Tracey whe she gets in - the style often found in restaurants in Greece. 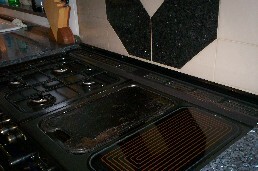 Get the flat griddle really hot, and wipe the surface with a very little vegetable oil. Slap the kebabs on the hot plate and sear each side quickly. Once the chicken is close to being cooked through, pour the lemon juice from the marinade over the kebabs. The juice will sizzle and caramelise, giving a tasty coating to the chicken pieces. Turn the kebabs over for the last time, and repeat the sizzling with the juice from the other half of the lemon. Serve immediately. Ingredients for cooking Minted Yogourt I have been serving my Greek-style Chicken Skewers with minted Greek yogourt for that authentic taste. Just whizz up in a food processor a few springs of mint from the garden with a very little olive oil and a smigeon of salt, then add a couple of large spoonfuls of yogourt. For an extra tang, add a single clove of garlic to the mint in the food processor. Serve with a little finely-sliced lettuce (Iceberg is fine), some chilli sauce and some toasted pitta bread (the wheat-free kind that Tracey prefers actually tastes quite good). Sometimes I also make chips (french fries) on the side, but I serve these in an extremely inauthentic style - very hot! For some reason, the french fries in Greece always seem to arrive tepid at best, which has more than once caused Tracey a certain amount of annoyance!